The varsity girls cross country team traveled to Northmont High School on Saturday morning to run in the 2018 GWOC Championship race. As has become the case over time, the girls ran another spectacular race, but came up just short of the state’s top-ranked team, Beavercreek. In the varsity race, the Elks fell to the Beavers, 40-46. The girls were led by sophomore sensation Emma Bucher, who finished second overall in a time of 17:42 and junior Kerri Walsh, who finished fourth overall in a time of 18:12. 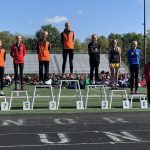 Also scoring for the Elks were Savannah Lowe, who finished 11th overall in a time of 19:05.8, Rachel Whitehead, who finished 14th in a time of 19:14.8 and Nikki Jindal, who finished 15th overall in a time of 19:22.2. In the girls reserve race, the girls also fell just short of the Beavers, 31-32. Leading the way for the Elks in the reserve race was individua race champion Alex Jackson, who won the race in a time of 20:01.6. 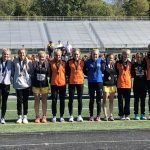 Also scoring for the Elks were Claire Maxwell, who finished fourth in a time of 20:27.2, Emma O’Brien, who finished eighth in a time of 20:35.0, Hannah Mangen, who finished ninth in a time of 20:36.7 and Kalie Adrian, who finished tenth in a time of 20:42.7. The girls start defense of their four straight state titles on Saturday when they travel to Cedarville University to compete in the OHSAA DI District Championship. Racing gets underway at 10:00 AM and the girls will be looking to qualify for the regional race the following weekend. A special congratulations goes out to Emma Bucher and Kerri Walsh who earned first team all-GWOC honors. Those two were joined by Rachel Whitehead and Savannah Lowe on the first team all-GWOC National League team as well.